Allowing Tibetans in Tibet to choose their own destiny may be the only way to end the current crisis and political deadlock. In November 2008, the Tibetan Parliament-in-Exile convened the First Special General Meeting on Tibet in Dharamsala, northern India, attracting 560 Tibetan delegates from nineteen countries. After six days of intense deliberations on ways to find a resolution to the urgent crisis in Tibet, the summit released final recommendations, which included urging the continued leadership of His Holiness the Dalai Lama and pursuing his ‘Middle-Way’ Approach. I attended this important meeting from London. Four years on, many changes have taken place worldwide, including the Arab Spring that brought the downfall of repressive regimes in some North African countries, and the creation of a new state – South Sudan. On the Sino-Tibetan conflict, despite unprecedented events of over 50 Tibetan self-immolations, Beijing and Dharamsala are currently in a political stalemate. Repeated calls from Dharamsala that urged the Chinese authorities to allow foreign journalists, diplomats and independent monitoring groups to assess the real situation inside Tibet not only fell on deaf ears in Beijing, but the Communist rulers refuse to acknowledge any problems in Tibet. Meanwhile, few major changes have taken place in the domestic Tibetan political scene within the exiled community. In the past year, His Holiness the Dalai Lama took a drastic decision to transfer his remaining political authority to the elected Tibetan leadership, thus turning his earlier ‘semi-retirement’ into ‘full-retirement’ from the political leadership, resulting in the transformation to a fully functioning Tibetan democratic society. This also paved the way for a historic ending to 369 years of the Dalai Lama Institution's (also known as the Gaden Phodrang) political reign over the Tibetan people. It is just over a year that the young, charismatic, Harvard-educated and exiled born Tibetan legal scholar, Dr Lobsang Sangay, was elected by the Tibetan diaspora as its political leader, commonly known as the Kalon Tripa of the Central Tibetan Administration (or Prime Minister of Tibetan Government-in-Exile). The new Tibetan leader in Dharamsala has recently come under increased pressure to contain the ongoing self-immolations in Tibet. Dr Sangay has publicly stated that since his accession to the exiled political leadership, the number of self-immolations by young Tibetans in Tibet has increased dramatically. Beijing has pointed fingers at exiled Tibetan ‘splitists’ as the masterminds behind such tragic acts. Dr Sangay hit back by stating that the 'repressive policies of China' have led to such desperate acts by Tibetans living under the Chinese communist rule. In June this year, two senior envoys of the Dalai Lama – Lodi Gyari and Kelsang Gyaltsen – resigned from their posts out of sheer ‘frustration’ at the lack of progress during nine rounds of talks with the Chinese Communist Party representatives, which started in 2002. The envoys stated that Beijing “did not respond positively” to the detailed proposal of the Dalai Lama’s ‘Middle-Way’ policy, documented in the ‘Memorandum on Genuine Autonomy for the Tibetan People’ and the follow-up ‘Note on Memorandum’, which they submitted to their Chinese counterparts in 2008 and 2010 respectively. Earlier in the year, the elected Tibetan leadership in Dharamsala announced the convening of a Second Special General Meeting to discuss the current urgent crisis in Tibet. Some 500 Tibetan delegates from around the world are expected to attend this special meeting in Dharamsala from 25 to 28 September. Given the current situation, I hope that the Tibetan delegates will pay some attention to one of the recommendations from the First Special General Meeting which called to 'pursue complete independence or self-determination if no result comes out in the near future'. If the forthcoming special meeting is to be taken as a serious follow-up to the first one, then Dharamsala must not only thoroughly review the core issues and necessary strategic action plans but, in my view, it also needs to actively pursue some well thought-out plans, including advocating for an acceptable channel through which the Tibetans in Tibet could have a voice in their own destiny and not just react to external events. Since the Tibetan people have the right to claim ‘self-determination’ under international law, they should never lose sight of this universally acceptable resolution for Tibet’s future. More so, they must remind and demand that the Tibetan and Chinese leaders in Dharamsala and Beijing respect and secure the Tibetan people’s fundamental interests. It is also long overdue that the international community bears some moral responsibility in helping to resolve the ongoing political and human crisis in China-occupied Tibet. Tibetans have received a great deal of sympathy from people across the world to their peaceful struggle, which they appreciate. The recent Europe Solidarity Rally for Tibet, held in Vienna on 26 May 2012, is another example of Europeans’ continued support for the Tibetan cause. A meaningful global support could be aiming to facilitate a referendum for Tibetans in Tibet, whereby they would be given the freedom to express whether they wish to remain under the present rule of the Communist Party of the People’s Republic of China, or choose a different form of political governance to cater their needs. It is also time for Tibetans to knock on the doors of the UN and other major international bodies such as the EU, ASEAN and SAARC countries, calling for tangible multi-lateral action whilst seeking increased co-operation from the alliance (both governmental and non-governmental) of political leaders, law makers, leading world figures and support groups who are sympathetic to the Tibetan cause. In addition, the forthcoming summit in Dharamsala should unanimously call upon the Central Tibetan Administration to convene an international conference on Tibet in 2013, to coincide with the 100 years of proclamation of Tibet’s independence by the Great Thirteenth Dalai Lama, with invitations reaching representatives of countries worldwide, to prepare for a multi-lateral roadmap towards a peaceful resolution of the Tibetan situation. Tsering Passang, who works for the London-based Tibet Relief Fund, is an exiled-born Tibetan rights advocate. He regularly lobbies UK and EU officials and parliamentarians. His previous articles on Tibet and China include: The China-Tibet Conflict: Need for Historic Decisions (2008, Phayul); Thin Ice on the Horizon for Tibetans in Nepal (2009, The Nepal Monitor); Securing Tibetan people’s interests: The Dalai Lama knows best (2011, Tibet Society UK). 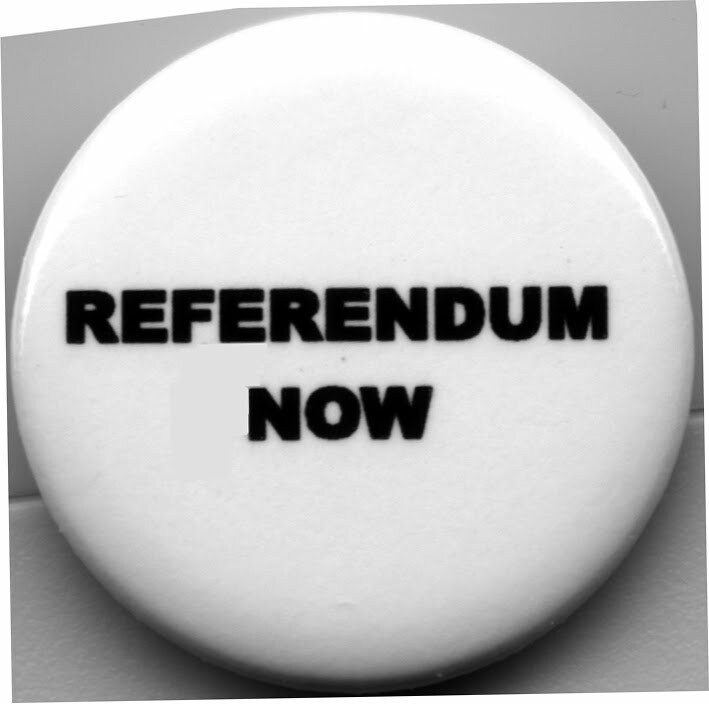 Originally published at OpenDemocracy, http://www.opendemocracy.net/tsering-passang/referendum-to-end-crisis-in-tibet. Republished in TPR with the author's permission.